The Alaskan Mill website is changing. Due to our growing dealer network this website will become a buyers guide for Alaskan Mills rather than a full e-commerce site. This will happen on or after 11th May, 2018. 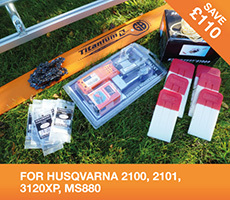 Loyalty Points – we have a record of all loyalty points so to transfer them simply place your next order on the www.chainsawbars.co.uk website. We will then either refund off that order or add your Sugi points to your account on chainsawbars. Any further questions or queries please contact us using the contact page. Alaskan Mill chainsaw mills from Granberg are the most economical and best known chainsaw mills in the world. We also sell milling bars, ripping chain and spare parts in order to make sure you get the most out of your timber. 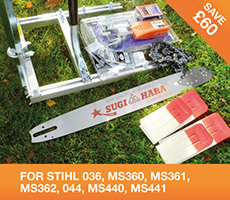 We stock and sell chainsaw milling kits for Stihl, Husqvarna, Echo & Dolmar chainsaws. These kits include everything you need to turn your chainsaw into a mobile mill. The milling kits include the Alaskan Mill, guide bar, ripping chain, grinding stones, precision grinder and a basic winching kit. We stock and sell chainsaw milling guide bars for Stihl, Husqvarna, Echo & Dolmar chainsaws including Lo Pro milling bars. Select a bar and then scroll down for chains that fit. At Alaskan Mill, we are continually striving to improve our products and services. We would welcome feedback on how to improve this website or if there any other products you would like to see. Alaskan Mill is a trading name of Always Greener Limited. This is the fourth generation Alaskan Mill website and we hope you like the improvements. For over 10 years we have been the exclusive supplier of the Alaskan Mill and other Granberg products in the UK. 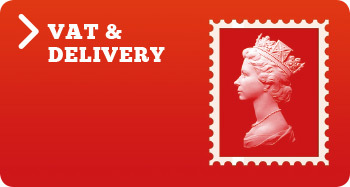 We ship worldwide and have a fully stocked eBay shop. You can also view our YouTube videos and the wealth of information contained on our sponsored sub forum on Arbtalk. We hope you enjoy using the site and keep on milling!